I am a relatively new transplant to the gorgeous state of Maine and I live in gratitude every day to be blessed with such beautiful surroundings. Through Energy Medicine and meditation, I have learned, along with so many other things, that living in gratitude is an essential part of well-being. Not only do we need to be grateful for what we have today, but also what we are confident will come to us in the future. I am determined to inspire you to believe that you are made of energy . . . and that energy can be transformed simply by combining your thoughts, beliefs, and emotions. If you put your thoughts on something and believe with all your heart that “the something” will happen, and if you can feel the emotion that “the something” would bring, it will become your reality. It’s just that simple! Let me show you how. Life is exactly what you make of it. Why not make it beautiful? For as long as I can remember I have suffered from chronic stress. I chalked it up to a lot of different things and always had a good reason to be completely stressed out and over-worked. This became “who I was.” It was my personality that I created and lived up to on a daily basis. Living in this state of chaos took its toll on my health. The excessive cortisol led to adrenal fatigue, a weakened liver, and suppressed immune system while several neurological disorders led to neck surgery. There is no doubt that I was desperate to gain back control of my health. It wasn’t for a lack of trying. I am a certified yoga instructor and have been practicing yoga for over 15 years. I have studied Ayurveda and have been meditating for over 5 years. I attended several meditation retreats, gone through the 8-week MBSR Mind Course (Mindfulness-Based Stress Reduction), exercise daily, and enjoy lots of hobbies. I thought I tried every trick in the book to reduce my stress. But something was still missing and it was the basic understanding of quantum physics that finally freed me from my old self. I learned just how important thoughts and emotions are and just how sensitive energy actually is. As energetic beings, we are so susceptible to manipulation (be it positive or negative). Anger and hostility can immediately drag us down, but on the flip side, love and gratitude can positively alter the cells in our body. One thing I know for sure is that we have the power to heal ourselves and the connection between mind and body rules our health. I finally got it all figured out. I regained control of my life and created an entirely new personal reality. Saying goodbye to my “old self” was one of the most refreshing things I have ever done. Knowing that everything in this world is energy and love is THE MOST powerful energy on earth has changed my life forever. Love heals all. Through my Reiki training, I have learned how to be a conduit of this pure energy to help others balance, restore, and heal. 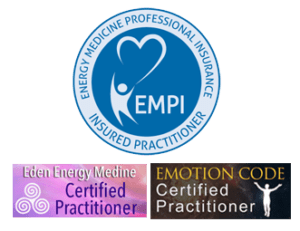 I am a Certified Eden Energy Medicine Practitioner and I am also a Certified Emotion Code™ Practitioner. With these skills, I am confident I can change your life. Nothing brings me more joy than sharing these gifts and this knowledge with others.